Accepting Putin’s offer would go against long-standing Japanese position on the territorial dispute. Russian President Vladimir Putin used an appearance at the Eastern Economic Forum in Vladivostok on Wednesday to float the idea of signing a peace treaty with Japan “without preconditions” by the end of 2018. The proposal seems to have caught Prime Minister Shinzo Abe off guard, with the Japanese government’s top spokesman telling reporters it had not been raised at the leaders’ bilateral meeting just two days earlier. Tokyo quickly reiterated its preferred course: resolving Japan and Russia’s long-standing territorial dispute before finalizing the post-World War II peace treaty. On Monday, after the pair met on the sidelines of the annual event, Putin said it “would be naive” to think the territorial dispute over Russian-controlled islands to Japan’s north could be solved quickly. 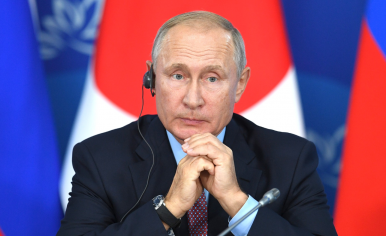 However, Putin attempted to seize the initiative on Wednesday, shortly after Abe told a plenary session that it was up to the two of them to finally make progress. “I and President Putin share the view that it is an abnormal situation that Japan and Russia have not concluded a peace treaty although more than 70 years have passed since the end of the war,” Abe said. The disputed islands, known as the Southern Kurils in Russia and the Northern Territories in Japan, were seized by the Soviet Union in 1945 in the closing stages of World War II. In 1956, Japan and the Soviet Union agreed to end “the state of war” and restore diplomatic relations. In that joint declaration, the Soviet Union agreed to transfer to Japan two of the islands, Habomai and Shikotan, after the ultimate conclusion of a peace treaty. Indeed, Russian government officials later indicated the envisaged peace treaty could specify that the two sides would continue to discuss unresolved issues such as the territorial matter. This phasing is politically unpalatable to Tokyo, which would fear losing “what little leverage it has vis-a-vis Russia after the signing of a peace treaty,” according to Temple University Japan associate professor James Brown, who specializes in Tokyo-Moscow relations. In recent years, Abe has pursued joint economic activities on the disputed islands in a bid to build momentum toward a more durable solution. At the beginning of 2018, Abe argued that Japan-Russia ties had “the most potential of any bilateral relationship” – an upbeat sentiment reaffirmed in Japan’s annual Diplomatic Bluebook released in May. However, even the modest economic initiatives have been slow to get off the ground, amid uncertainty over the legal framework that might apply to such activities. What would such a peace agreement include and can it be delivered?